It was a great evening and we would like to add our thanks to all the people who enjoyed the music, wine and ambiance of the event. Felix had produced some truly stunning guitars that were on show and available to purchase, and they will remain so at the Corner Gallery from now. So, if you weren’t able to get to see the collection due to over crowding… please pop down any time! A big thank you to everyone involved in putting on the launch evening and we look forward to seeing you all again at the Tithebarn Workshops soon. There are plans for up to 300 dancers and 100 musicians to take part throughout Bradford, so it should be a great spectacle and we’re looking forward to seeing all the festivities. The day is raising funds for Dorothy House and more information is available via the BOA Morris Day website. The sun is out, the shops all have their new stock in, the blossom is just making an appearance, the flowers are in bloom, the Tearooms have got all their tables out and we’re ready for the new season at the Tithebarn Workshops. We look forward to seeing our regular clientele as well as welcoming many new customers this year. We have meaning to say a big thank you and well done to Andre of Le Corre Gallery, for his amazing work in putting together this wonderful addition to the garden at the Tithebarn Workshops…. 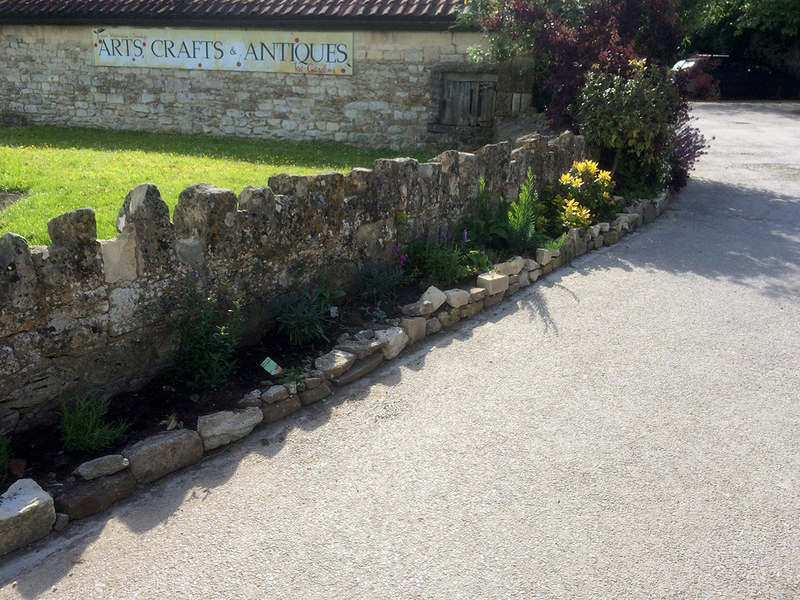 Andre has been on his hands and knees for hours digging over the bed, putting up the wall and planting a lovely selection of plants… and all for the love of gardening! We hope to see you all down here at the Workshops soon. Come down to the Tithebarn Workshops and enjoy a wonderful day out.